A new organization dedicated to saving and celebrating the heritage of working people! The Bridges Center is proud to announce the establishment of the Friends of the Labor Archives, a new organization dedicated to advancing the preservation and promotion of labor history through financial support and community outreach for the Labor Archives at the University of Washington. Since 2010, the Labor Archives has worked to preserve and make accessible the records of working people and their unions, documenting the local, national, and international dimensions of the labor movement. Members of the Friends will receive regular updates on the activities of the Labor Archives. They also receive special invitations to events highlighting the labor history education, outreach and research made possible by the Archives. The Labor Archives of Washington is been made possible by the grassroots contributions of the labor movement. In that spirit, the financial support pledged by the Friends is an essential part of continuing the work of the Labor Archives into the future. Questions? Contact the Bridges Center at (206) 543-7946 or hbcls@uw.edu. To join the Friends of the Labor Archives, print, complete and mail the membership form to the address provided on the form. You may also join by donating on-line. Review the membership levels, and make a corresponding gift through the University of Washington's secure on-line giving website. For full-color copies to share with your community, organization, or union local, contact the Bridges Center. Download a Labor Archives brochure! Founded in 2010, the Labor Archives of Washington is a collaboration between the Harry Bridges Center for Labor Studies and the University of Washington Libraries. Funding for the Archives comes largely from the labor movement. The contributions of dozens of unions and hundreds of individuals make this possible. Their names will be recorded on a plaque accompanying the statue of Harry Bridges in the entrance to Suzzallo Library on the University of Washington campus. Major donors include the International Longshore and Warehouse Union (ILWU) Longshore Division ($150,000); Washington State Labor Council ($30,000); Harry Bridges Center for Labor Studies ($30,000). Donors who have given $500 or more to the Labor Archives of Washington State will be memorialized as members of the Labor Archive Founder’s Circle. 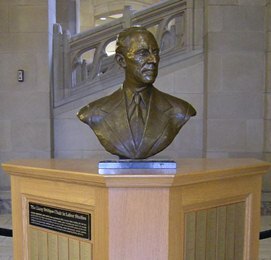 Founder’s Circle names will be inscribed on a plaque and displayed with the Harry Bridges statue in the entrance to the University of Washington’s Suzzallo Library. Make a Monetary Gift online to the Labor Archives. Recognizing the need to protect the heritage of labor in Washington state, a group of labor leaders and labor scholars associated with the Harry Bridges Center launched the campaign to create a Labor Archives in 2008. They called themselves the Labor Archives Organizing Committee. The campaign quickly drew the support of the Washington State Labor Council which endorsed the plan at its annual convention and pledged $10,000 a year for three years. The Harry Bridges Center pledged a similar amount. The biggest commitment came from the Longshore Division of the International Longshore and Warehouse Union. The ILWU issued a matching challenge, pledging to match contributions up to a total of $50,000 during each of three years from 2009-2011. Dozens of unions, labor councils, and other organizations have responded to the challenge and have been joined by more than one hundred individual donors. In Spring 2010, the Harry Bridges Center for Labor Studies and the UW Libraries finalized an agreement about managing the Labor Archives and announced a national search for an experienced Labor Archivist to manage the enterprise. Conor Casey was chosen and accepted the position. The Labor Archives of Washington officially opened in October 2010.